I'm starting this post while the bread is in the oven. The smell of baking cinnamon bread is intoxicating. All I can think about is how hungry I am. I doubt there will be any of this loaf left. I have to make sure that I get photos before we dig in. I recently discovered Vietnamese cinnamon. I'm not sure why it is so much better than regular cinnamon. Vietnamese is much more potent, bordering on spicy. The cinnamon in this recipe is enhanced with the sharper and earthier flavor of nutmeg. We're making a basic yeast bread recipe slathered in butter, cinnamon and sugar. A rare treat to be enjoyed and savored and eaten fresh out of the oven. The recipe starts with mixing all the dry ingredients, save one cup of flour and then mixing all the wet ingredients together and heating them to perfect yeast temperature (115-125 degrees F). Then mixing all the wet into the dry. This makes a very strange dough that at first is almost crumbly and then the more it is worked becomes very sticky. That's when you add in the rest of the flour. Then you have a nice elastic dough which is allowed to rise until double before being made into leaves. Roll out the dough into a large rectangle about 12 by 20 inches. Slather on the melted butter and top with the cinnamon, nutmeg and sugar mixture. Then cut the leaves. Cut the dough into six strips and then stack them up. Cut the stack of strips into three or four stacks. I cut it into four and they could have been wider for my 9x5 inch loaf pan. Lots of cinnamon sugar will fall out, just scoop it back up and put it on top of the leaves. Place the leaves in a buttered 9x5 loaf pan. Let rise a second time until double. Then bake for 30-40 minutes at 350 degrees. This is also a good time to consider making coffee, because when this comes out of the oven you will want some bitter coffee to balance the sweet gooey cinnamon leaves. Take the bread out of the oven and invert it on a plate so all the syrup that was bubbling at the bottom trickles down the sides. Let it set for five minutes so you don't burn your fingers and then dig in. This was the perfect breakfast for a rainy Sunday morning. The only downside being I didn't have as much natural light to work with so the photos don't quite capture it. I swear it looks even better than this. 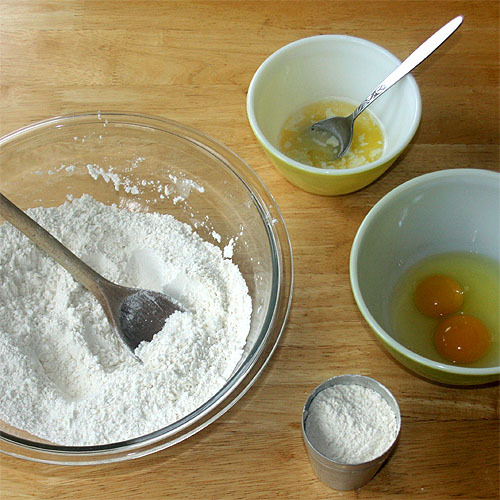 Mix the dry ingredients (flour, sugar, yeast and salt) together in a large bowl, reserve one cup of the flour. On the stove or in the microwave, heat the milk, water, and butter until the butter is liquid. Allow the mixture to cool until it is still warm, but you can touch it with out burning yourself. Beat the two eggs together in a small bowl. Then add the butter mixture, eggs and vanilla to the dry ingredients. Use a wooden spoon to combine. The dough will take a while to mix. 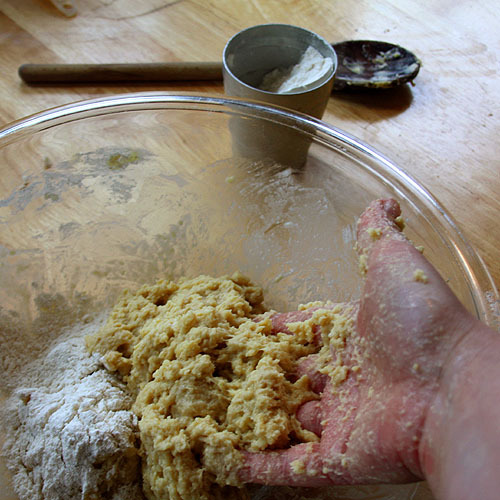 Once everything is a very sticky dough, kneed in the remaining one cup of flour- about five minutes of kneading should do it. 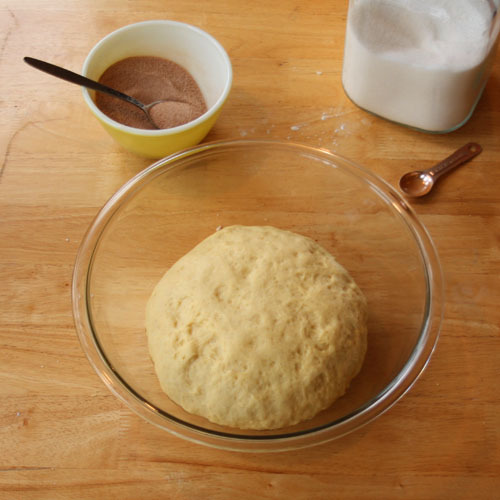 Place the dough in a greased a bowl, rise with a clean towel over top until double. I like to warm my oven for a five minutes then turn it off and let the dough rise inside the slightly warm oven. It should take about an hour. Bread will rise really fast at about 90 degrees. Roll out the dough on a clean surface to 12 by 20 inch rectangle. Now your ready to add the filling. Brush the melted butter over the surface of the rolled out dough. 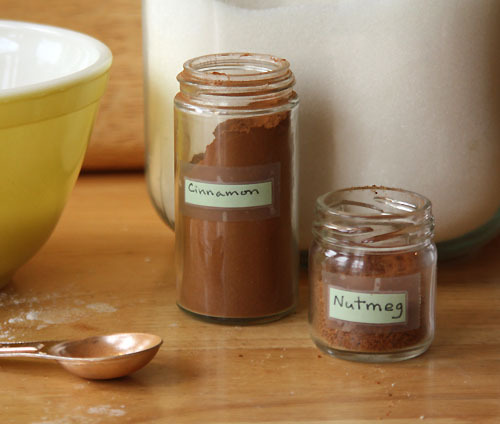 Then mix the cinnamon, sugar and nutmeg together and sprinkle it over top. It will seem like a lot, just trust me on this part. Then cut the dough into six strips. Stack the six strips on top of each other. Cut those strips into three or four stacks of squares. Put the stacks of squares into the greased 9x5 loaf pan. Allow to rise a second time until double (about 15-30 minutes). Bake at 350 degrees for 30-40 minutes. Check to make sure the loaf is done before you tip it out by using a butter knife to press down on the top, if it springs back it is done. If it doesn't the dough isn't quite baked, put it back in the oven for another 5 to 10 minutes. Use the butter knife to loosen the edges then invert the bread onto a plate. The syrup that was made from all the sugar, is really hot and will run down the edges. Let the bread set for five minutes before you dig in so you don't burn your mouth. And don't forget to pour yourself a cup of coffee or a glass of milk. Enjoy. This recipe was submitted to Yeast Spotting and Simple Lives Thursday. So glad to comment first...I have never seen this method, i JUST LOVE IT! How special, wish I could have some. This looks just terrific!!! 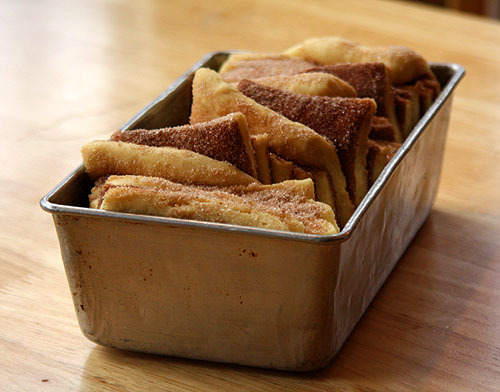 I've never seen a cinnamon bread put together quite this way but I bet there is cinnamon in each and every delicious bite. Yum! These look awesome. Can't wait to try!!! Wow this looks amazing! I love the smell of fresh bread especially bread with cinnamon. Yum! I will have to try that soon! Thanks for sharing. This looks absolutely divine! My husband makes most of the yeast breads around here, so I'm going to give him the recipe. Cinnamon leaves? I was a little confused, but what a fantastic surprise to see the sweet and gooey "leaves" at the end of the post. Will try this soon. Yum, wow this looks so good. I must make it. your cinnamon leaves are so appetizing...I'm a weaker for pull apart breads...I'm hungry. This looks amazing, I love cinnamon in everything. This is like the perfect cinnamon roll loaf! This bread looks awesome, a perfect weekend treat. I agree with you about the Vietnamese cinnamon. Wow! It's like monkey bread, but 10x easier. But I don't think I should make this unless I have a big group to share it with, because sweet breads never seem to keep well no matter how I store them. Really nice! I love how you stacked the pieces together and put them in the bread pan. Yeast intimidates me though..yours looks lovely! Oh my! Looks delicious-I can almost smell it. Congrats on the Tastespotting pick! Oh my! This is BEAUTIFUL! I can't wait to try it - stunning photography! Your "leaves" look so good. I love cinnamon, too, an have discovered Vietnamese cinnamon. It makes such a difference in the flavor of what you are baking. Oh my, I really, really love this. And your lighting looks just fine - I'm drooling, so something is right! Oh my goodness, I can only imagine how your house smelled while writing this post. I have got to get my hands on some Vietnamese cinnamon quick! 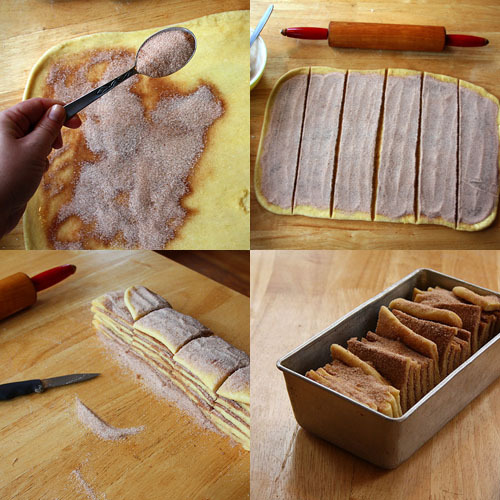 I have never seen cinnamon bread made this way, I have to try it! It looks amazing. Thanks for this recipe, Foy! Can't wait to try it out this weekend. I've still got whole nutmeg from Wheatsfield, always looking for recipes to use it! Now if I could only find Vietnamese cinnamon... Penzy's rush order, maybe? @Clarissa - I got my Vietnamese cinnamon from wheatsfeild pretty sure. It's a little more expensive, but it is worth it. Cinnamon leaves would be delicious with regular cinnamon. Just add a half teaspoon extra or so. 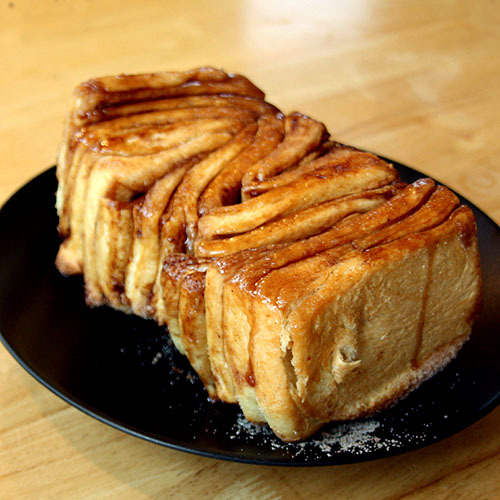 Nice take on cinnamon bread! Oh wow. I've never seen this method before, and I have a batch of whole wheat dough in my fridge that needs to be used today, so I think I'll be trying it out. I am loving this recipe. It looks wonderful. How long will this stay fresh? It looks delicious, and I would love to make some tonight and bring it with me tomorrow when I visit my sister!! Amazing recipe!!! I'm making this today. @Ashley - How long will Cinnamon Leaves keep? It really is best right out of the oven, but it will keep two days if wrapped at room temperature and I'm sure you could freeze it and reheat it with some success. I love the idea of the "leaves" being the bread itself. Glad you discovered a new cinnamon! Wow - can't wait to try this - thankyou! I have been wanting to make this for a while. I am going to have to try some of that Vietnamese cinnamon. Spicy sounds great! The technique and my imagining of the aromas of it baking is making me really hungry! The loaf looks awesome. Need to try it soon. Thank you for the recipe. That is a very lovely creation you have there! I envy you for having more time in the kitchen! 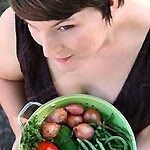 Thanks for connecting with me on Foodbuzz ~ I'm buzzing this recipe! O my God, it actually goes to my favorite! As I love everything with cinnamon, this laso looks amazing, great effect! I made this last night and the grand kids were over today so I am making another tonight.....I will have some in the morning and take the rest to work. This reminds me of some of my Swedish Mothers recipes minus the cardnamom of course...yum..yum..!!! When should you add in the vanilla??? Shoot! I hate it when I leave information out. Vanilla goes in when you add the eggs. I'll update the recipe right now. Amazing! Really easy and delicious! Awesome flavor and texture. I will be holding onto this recipe forever! !